Weddings at Calamigos Ranch are a nature-lovers paradise, with trees and plants everywhere. This couple's Indian and Sri Lankan wedding took place under a massive tree, which provided a beautiful canopy of greenery over the couple and their family members. Garlands are exchanged as part of the Jai Mala, which signifies a bride and groom's acceptance of one another. The Jai Mala takes place after the bride enters the ceremony area, and the wedding ceremony itself takes place directly after. Some couples exchange garlands once, while others may exchange garlands back and forth numerous times. After the garland exchange, some pundits (or officiants) ask the couple to turn towards the audience and smile. Other pundits just start the ceremony. I love seeing what florists do with their garland styles. Some are more traditional red and white, while others can be huge and involve many colors and types of flowers. 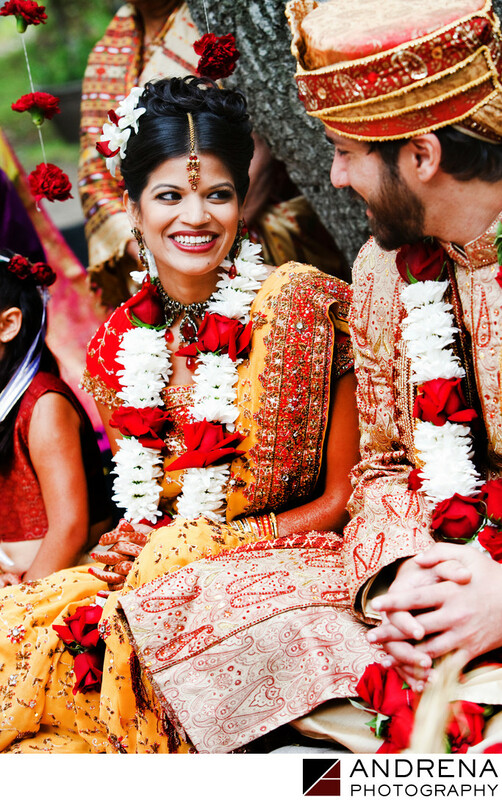 No matter what the case, garlands are always so beautiful, and add such an elegant touch to an Indian wedding. Indian wedding photographed at Calamigos Ranch in Malibu, California.